After entering the observatory I delayed powering on the 12" LX600 due to the breezy conditions. I just enjoyed watching the stars come out. 1927 MST: I stepped outside of the observatory to do some handheld D850 DSLR sky photography using a 8mm fisheye lens. I saw a bright light in the western sky near the Zodiacal Light. 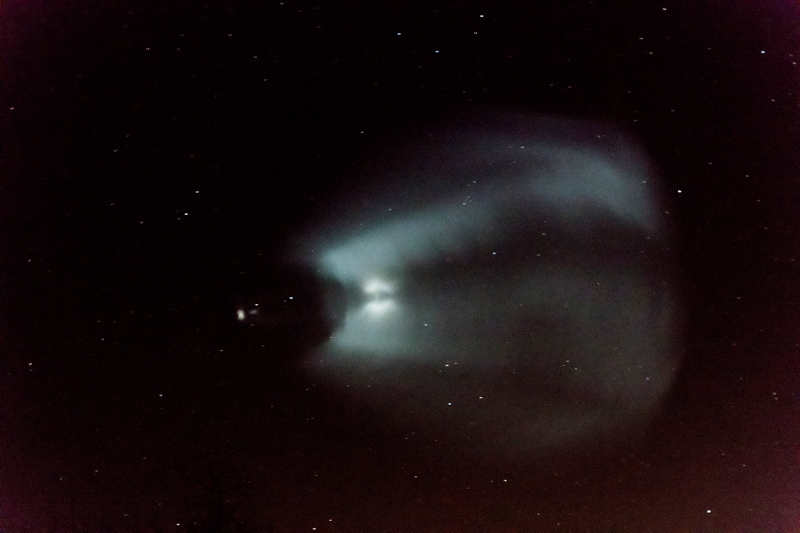 At first I thought it was an airplane light in a cloud. But then I realized there were no clouds there. I took a quite look at the object using 12x50 binoculars. 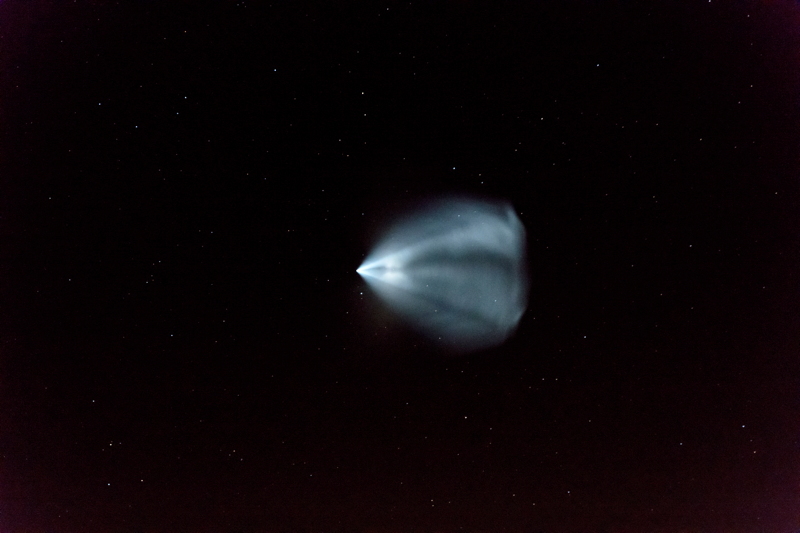 It had to be a rocket. And then I remembered that SpaceX was planning to start the Tesla car and spaceman on its way out of Earth orbit at about this time. 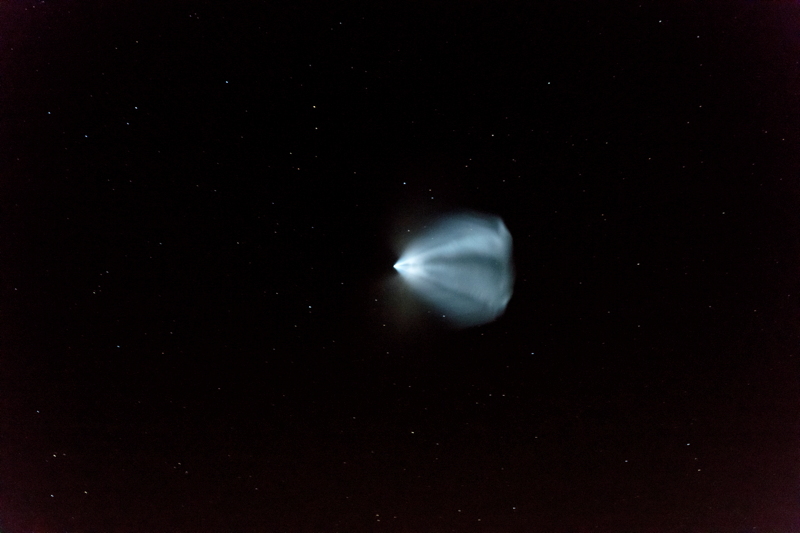 The object HAD to be the SpaceX rocket burn (and it was). 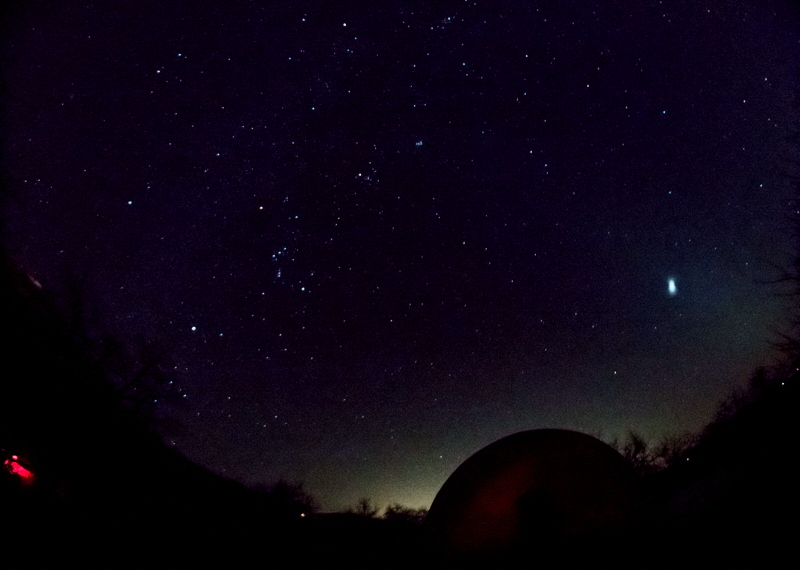 The photo above shows the silhouette of the observatory dome at the bottom, the constellations of Canis Major, Orion, Gemini, and Taurus, the Pleiades, a hint of the Zodiacal Light at the right, with the SpaceX rocket at the right near the Zodiacal Light. A pretty impressive sight. 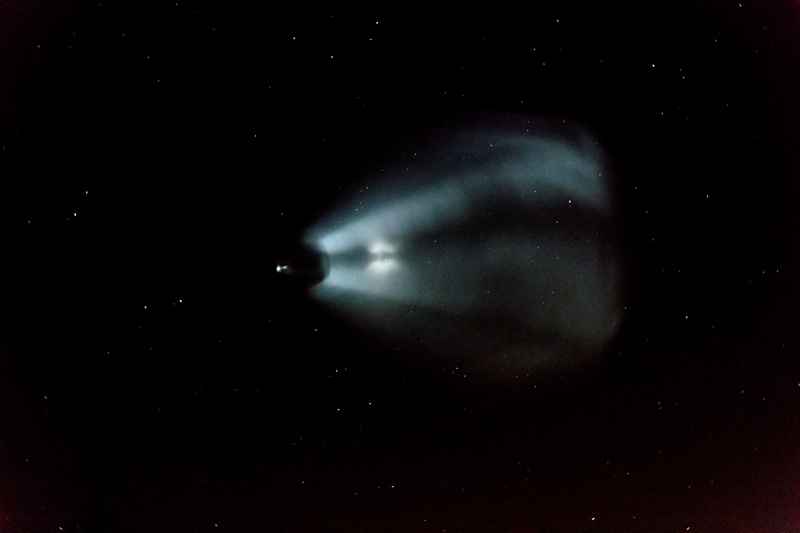 I would never have been able to capture handheld photos like these with my older DSLR. The D850 is a superb night camera. 1946 MST: LX600 ON, StarLock OFF, High Precision OFF. Dome OFF (onto the PZT). SYNCEd on the star Aldebaran. Prepared the D850 DSLR for imaging. 2000 MST: Wi-Fi ON. 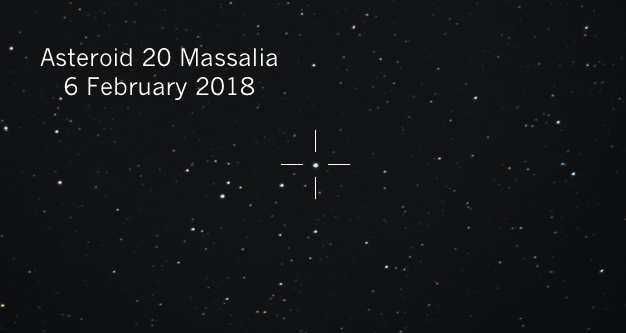 Used SkySafari 6 Pro to GOTO the Asteroid 20 Massalia. Slewed back to Aldebaran, mounted the D850 DSLR at prime focus + focal reducer. Slewed back to the asteroid. 2010 MST: took a StarLock autoguided, 2 minute, ISO 6400, exposure. 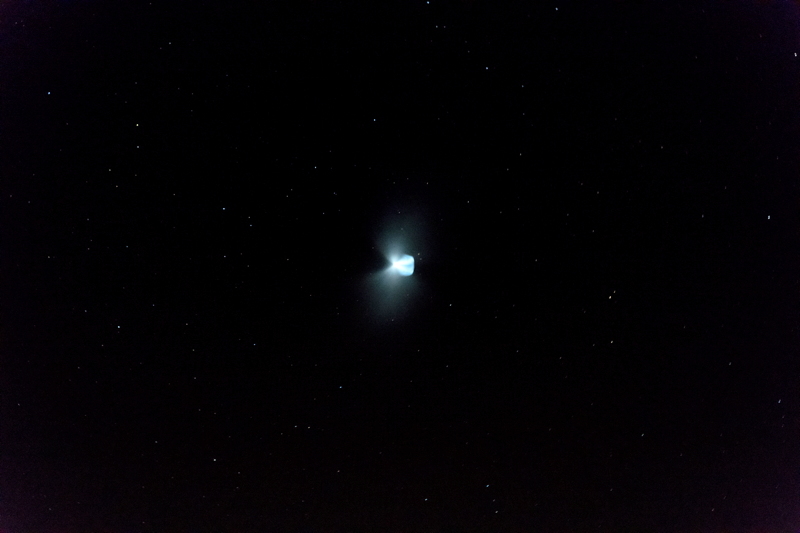 2110 MST: took a second StarLock autoguided, 2 minute, ISO 6400, exposure of the asteroid. 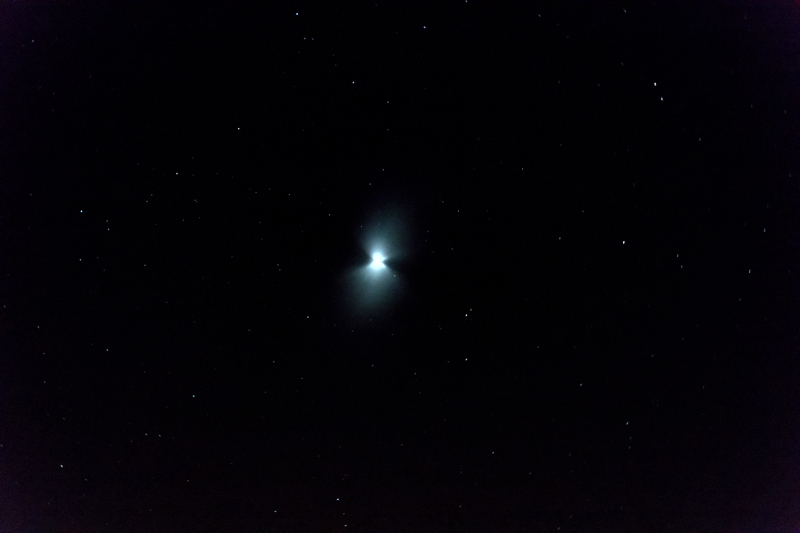 Next, I did some tests of aligning the DSLR to see if a suggestion I received would work. The issue was how to consistently align the orientation of the camera from night-to-night. This technique was straightforward. Point the telescope at a moderately bright star and then slew back and forth in Right Ascension. I used a focus square in a magnified Live View as an alignment marker and rotated the camera until the star moved parallel to horizontal lines of the square. This seemed to work pretty well. Thanks John! I have posted my review of the Nikon D850 DSLR.